Shirl’s comment in the previous entry inspired the creation of a landscape version of the 3×5 card footer to complement the existing portrait version. Check it out on the Downloads page. Here’s a quick little hack that lets you park your hPDA and Circa 3×5 notes right in front of you while you work at your desk. My Hipster PDA features three small Rollabind rings across the top, turning it into a reporter style flip notebook. The small rings are unobtrusive in the back pocket, and facilitate flipping back and forth between pages more easily than removing and reattaching the standard hPDA binder clip. The use of the rings (okay, they are properly called discs, I know) lets me transfer notes between my back pocket, master notebook, and assorted project files quickly. But in the office, I like to park my to-do list right in front of me while I work. Other than Levenger’s classy — but ginormous — 3×5 card bleachers, there are no free-standing desktop card holders out there. So I decided to make one . . .
where does the writer fit? But that’s not when you want the writer to start getting involved. A successful collaboratively-written product — a user manual, a proposal, a textbook, an online help file, an annual report — needs to have the writer involved from the beginning, as an integral part of the team. Author Paul LagassePosted on February 1, 2007 May 5, 2008 Categories For Managers, Tips & TechniquesTags baltimore, freelance writer1 Comment on where does the writer fit? I’ve never been a big fan of the stitched-on pen loops that come with many daily planners, pad holders, and upscale notebooks like the Circa Leather Foldover. I find that when the notebook’s open, they get in the way; when the notebook’s closed, they keep the book from closing all the way. Six months ago, I completed the transition of my work-related project and administrative paper files over to a system that uses Rollabind discs as its (literal) backbone. The results have been overwhelmingly positive. Rollabind and Circa products have notably improved my file storage, retrieval, and transfer processes, note-taking, and task management. They’ve even inspired some useful hacks that I will cover in detail in future entries. Rollabind even wooed me away from legal pads, which had been my constant companions since college. Amazing. 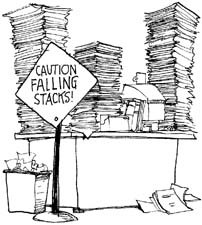 However, for all the inherent strengths of the various products that I’ve tested and adopted for use, there are still some important gaps that need to be filled before the system can be considered a full-fledged paper management system. AV’s first writer-optimized downloads — templates for the Hipster PDA (hPDA) — are now available on the Downloads page. Using the same soothing, minimalist appearance as the new Active Voice website, these templates take maximum advantage of the limited real estate of the 3×5 card by favoring writing space over boundaries. Because all great hardware needs equally great software. And when the hardware is paper, the software must be ink. Along with redesigning the look and feel of the Active Voice website (this is the fourth major iteration, for those keeping track), I’ve decided that it’s high time I launched a blog as a way to interact with clients and colleagues through the exchange of useful tools, tips, and techniques. By way of an introduction: I launched Active Voice Writing & Editorial Services seven years ago after leaving a management position to become a full-time freelance writer. Since then, my clientele has grown steadily to include a variety of nonprofit and professional organizations, private companies, and the federal government. Along the way, I won a national award and in my spare time I wrote a novel that was published last year.